Welcome to Great Turtle Creations of Mackinac Island. 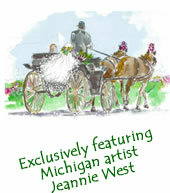 It is with great pleasure that we bring you customized wedding stationery with a Mackinac Island theme. 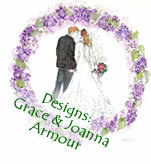 Choose from our large selection of beautiful themes created by our exclusive artist Jeannie West. Each image is a reproduction of an original watercolor painting. Our wedding selections are very extensive and include the important places on Mackinac Island. Text can be customized with your choice of font from our varied collection. Try our new additional services: scrapbook pages and custom postage stamps! We also offer notecards featuring Jeannie West's lovely and whimsical paintings. Choose from our wide variety of images perfect for any occasion–cards personalized with specific names or occasions. We look forward to helping you create the perfect theme for your wedding or special event stationery. Please contact us if you have any questions. We will be happy to help you customize your selections to meet your personal needs. Visit our order page for order information. We have also included a links page with connections to Mackinac Island businesses and organizations which might be of interest. Thank you for your interest in Great Turtle Creations of Mackinac Island.